PHILADELPHIA (AP) — Linval Joseph whipped out the sunglasses, sat on the bench and pulled on the oxygen mask . Kirk Cousins threw for 301 yards and one touchdown, the 330-pound Joseph returned a fumble 64 yards for a score and the Minnesota Vikings beat the Philadelphia Eagles 23-21 Sunday in a rematch of last season’s NFC championship game. “I love seeing Linval on the sideline in his glasses after plays. They have a lot of fun,” Cousins said. Cousins praised offensive coordinator John DeFilippo, who was Philadelphia’s quarterbacks coach the past two seasons. “Credit to Coach Flip for being aggressive as a play caller, giving us a chance,” Cousins said. Joseph snatched Wentz’s fumble out of the air and rumbled the distance to give the Vikings a 10-3 lead in the second quarter. Stephen Weatherly knocked the ball loose and Wentz couldn’t recover to catch Joseph from behind after the strip-sack. The Eagles finally got going on the opening drive of the third quarter, but Eric Kendricks forced Jay Ajayi to fumble at the Vikings 5 and recovered it. 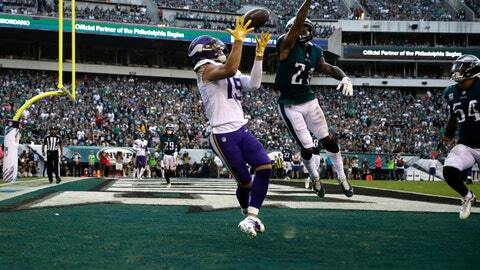 Cousins connected deep with Thielen for 68 yards on the next play and the Vikings reached the Eagles 2 before settling for Bailey’s 22-yard field goal. Wentz tossed a 12-yard touchdown pass to Wendell Smallwood, who benefited from the NFL’s new catch rule because the ball came loose when he hit the ground. Smallwood then ran in for the 2-point conversion to get Philadelphia within 20-14. Vikings: LT Riley Reiff left the game with a foot injury. … RB Dalvin Cook (hamstring) was inactive. Eagles: S Corey Graham left the game with a hamstring injury. … DE Derek Barnett (shoulder) and DT Haloti Ngata (calf) and RB Darren Sproles (hamstring) were inactive.